Nell’articolo Tab Layout in Android con ActionBar e Fragment spiego come implementare le tabs e nell’articolo Swipe views spiego come implementare le swipe views o scrolling tabs utilizzando ViewPager del Compatibility Package. In Implementing Effective Navigation è riportato un esempio per questo tipo di layout utilizzando ViewPager e FragmentPagerAdapter, che sono parte del Compatibility Package. 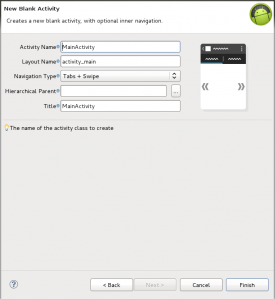 Ho notato che un codice simile si ottiene alla creazione di un nuovo progetto Android utilizzando Android SDK Tools Revision 20, e scegliendo come tipo di navigazione (Navigation Type) nel wizard di creazione del progetto “Tabs +Swipe” come in figura. Great tutorial! I’m trying to do the exact same in a project I’m working on. I followed your tutorial and it worked perfectly on its own as the main activity but when I set it to open as a separate activity with an intent the app always crashes. Any ideas why that might be? I figured it out: I started making the app and only later tried to implement the tabs. The original was too low an API and didn’t have an ActionBar configured. That’s why the newer ones worked, I had started them with this layout in mind. Thanks a lot for your example. Is the firts one I found that it works! Thansk a lot! How do i change tab text color in here?? You can see Styling the Action Bar and Android Action Bar Style Generator to modify the style of the tabs. I wrote a post in Customizing the labels of an ActionBar where I use a TextView as tab but you have to merge the code. piccola domanda…se dovessi interagire con degli elementi delle varie tab? per esempio se volessi scrivere un messaggio su un textView come posso recuperare l’id ? con findViewById ottengo sempre null. Great tutorial. I was trying for sometime to do this. Una spiegazione veramente molto ben fatta e lineare. io ho messo nella prima tab uno Spinner (riempito dinamicamente con dati di un db) e una EditText per l’inserimento di stringhe per la ricerca all’interno dello Spinner. Il problema è che quando cambio e vado alla terza tab e poi torno alla prima non trovo i dati caricati nello spinner, mentre ad esempio rimangono le stringhe inserite nelle EditText. great tutorial, helped me a lot to add tabs to my project, thanks a lot!!! But how can I use icons instead of text set @ tabLabel = getString(R.string.label1); for the tabs? Grande Tutorial….ho però un problema….quando l’ applicazione la faccio partire sull’ emulatore è tutto O.K. Di contro ho problemi quando cerco di farla girare sul mio smartphone samsung s plus quando lancio l’ esecuzione non compare il il dispositivo per poterlo selezionare … è un problema che ho solo con questo progetto…. Sarà forse legato all’ Api 14 ? Se il dispositivo non compare nell’elenco fra quelli disponibili significa che è escluso sulla base di quanto specificato nell’AndroidManifest.xml e probabilmente il samsung s plus ha le API 10. Thanks a million friend.. Good explanation too.. I want to hide the title bar from my app. By using actionBar.hide(); my application crashes. Bellissima guida è molto utile, però ho un problema, ho inserito un bottone nel file tab1.xml questo ha la funzione di aprire un altra activity, però quando vado a cliccare su di esso non funziona e non riesco a capire il perché. Ho provato ad inserire un precedente xml all’interno del tab1, nel mio xml era presente una ListView il cui layout era preso da un’altro xml (row.xml). 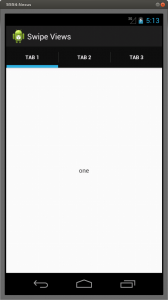 Prima dell’implementazione dei tabs l’applicazione visualizzava correttamente la ListView, adesso mi da un’errore di compilazione nell’ attributo tools:listitem=”@layout/row” e l’errore e’: Attribute is missing the Android namespace prefix . hai una qualche idea per risolvere il problema? I could not understand what meant in the reply. I´ve been searching day and night for help on this and I cannot find a suitable tutorial anywhere. I´ve followed two of your excellent tutorials, this and the swipe, but it just doesn´t help when each tab is meant to show a different class, with its own operations. Hi, awesome tutorial! Easy to follow, I just have one question: I am using your sample for a project and I want to get rid of the tabs at the upper portion. I would just like to be able to slide through different activities without seeing the tabs. Also, I have a problem, although I have successfully made my modifications, the app works on the emulator but not on actual devices. Hi, I have a little problem with webview fragment and ViewPager. To be more specific, with reloading webview after swipe tab. I know that you made a tutorial with onPause() method in which you describe how to avoid reloaidng, but I think that it doesn’t works with this tutorial. An in addition another question. 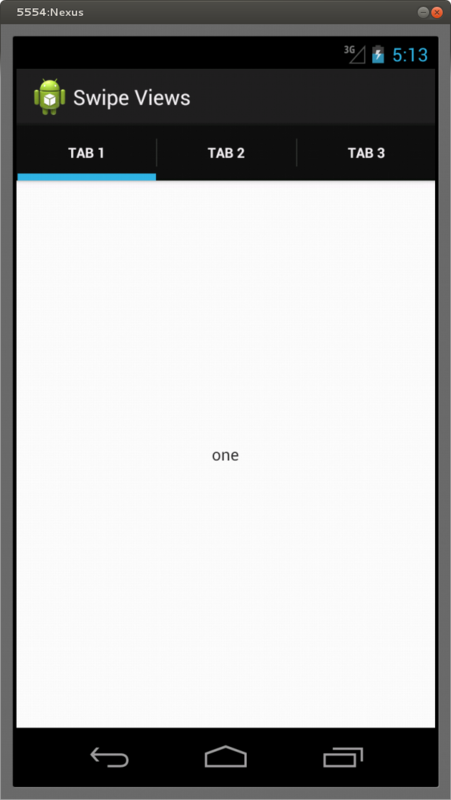 I made a progressdialog whish is showing while loading pages. After I added viewpager it doesn’t disappear when page is loaded. How to fix it, or add progressbar in actionbar directly? Great tutorial. how can I disable swipe for specific tab ? In this example you must use Fragments or classes extending Fragments, but Intents launch activities, services or broadcast receivers. Complimenti! Ottimo sito ed ottimo tutorial! I don’t understand, I don’t miss this code, it is at the end of my post. While navigating from one tab to another I am getting a runtime exception which says ResourcesNotFoundException. Although all layouts have been registered. Thanks for this tutorial. I have a question. How can I set listener to editText in tab1. xml. I was trying to set it in mainActivity, but the null pointer error shows. I realised that app is searching for this editText in main.xml, not in tab1.xml. 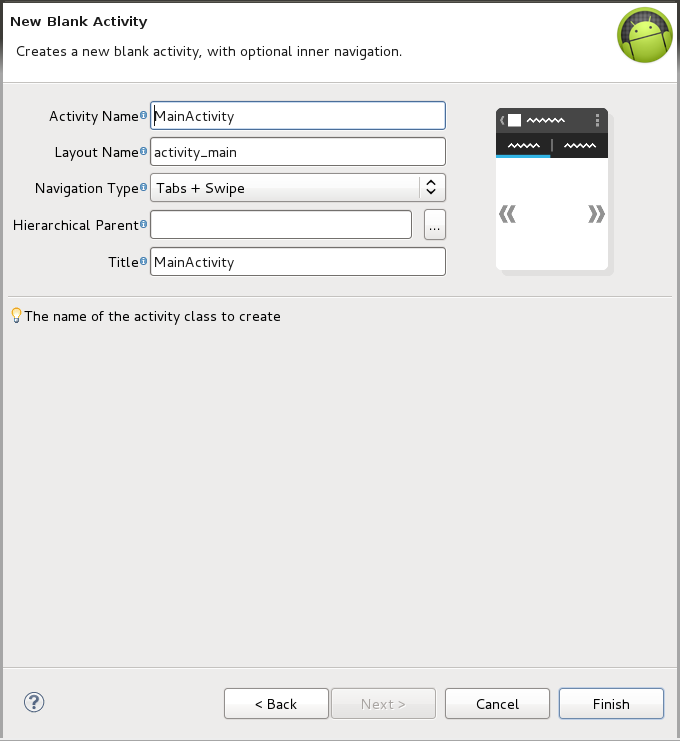 I think I should make tab1.class, and move all methods from mainActivity, to that new class. Can You give me some hints? There is not a full project url because there is not a full project. Very nice tutorial. It works on my Sony Xperia Arc S with Android 4.0. Do you maybe know if it’s possible to use icons instead of strings in titles of each tab? Great tutorial. I was trying for sometime to do this and finally got it. But now i’ve got another problem, maybe you can help me. I’m trying to setText a TextView on a tab_.xml, but i keep getting NullPointerException. So… how can I access the tab_’s content? Very nice tut !! I’m looking for a tut like this one since a long time. Can you explain also how to load fragment instead of xml view ?? You can instantiate layout elements at runtime without a xml resource.